Oregon, four musicians with a creative force capable of demolishing walls between genres, labels and categories, explored a minute portion of the endless possibilities in a two-hour timespan. For thirty years, Ralph Towner, Paul McCandless and Glen Moore have devoted their collective and individual energies to a quest of soundforms as natural as the call of a bird or as supernatural as a voodoo dance. Joined recently by percussionist Mark Walker, they performed for a captivated audience in St. Mary's Church in Philadelphia on March 19, 2001. 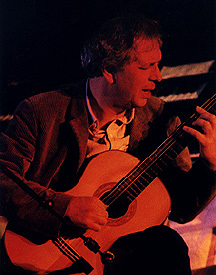 Ralph Towner performed a percussive/melodic classical guitar, unique in its freedom but well founded in the chord structures and classically oriented fingerstyle. 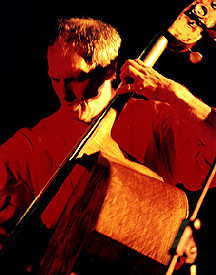 With upright bassist Glen Moore accenting Towner's motif with bowed bass as well as pizzicato and Walker tapping a well-placed rhythm on a drum kit, native drums and Latin percussion, a choice of pathways were revealed for the restless wind of Paul McCandless. 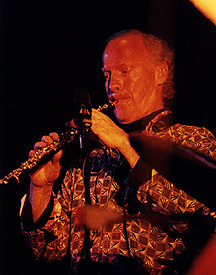 He explored with English horn, oboe, bass clarinet, soprano and sopranino sax, as well as whistle. Melody flowed like a spring thaw in a mountain stream, cresting and falling, winding forcefully over and around anything in its path. Together the foursome formed a wild river, each guiding the path, taking turns leading the way. Jazz musicians at the core, their talent for accompanying each other and interacting or reacting shows the gift that even Louis Armstrong would recognize, regardless of how far they have traveled from the mainstream. Oregon demonstrated their capability to fit into the pigeon hole of staight jazz this night, with Towner playing keyboard to perfection and McCandless playing sax in the city that nurtured John Coltrane. These interludes only made the freer pieces even more unique and demonstrated the enormous versatility of the combo. The range of emotions was broad. Towner's beautiful compositions were well represented, from the free-flowing form of "Raven's Wood" to the stately "The Templars," which was recently nominated for a Grammy. Each piece had an identity that the artists breathed life into. Pulse was provided by Walker, who, during solos was able to fit more beats into each measure than seemed humanly possible. Each of the two sets contained one spontaneously improvised composition. As Moore had been hovering over sheet music all night, he introduced them as playing "without our glasses." They were guided instead by amazing intuition and careful ears and minds, each participant contributing equally, but careful not to fall too soon into a recognizable musical pattern. A spark here and collaboration there, ignited a flame that turned into a wildfire, swirling around the cavernous domed surroundings. The second free piece culminated with a Bach-like aria, fitting the holy trappings appropriately. The results were intoxicating, even to Oregon. After the Gathering, Towner said they never know how they might end up, "even a polka," he quipped. Perhaps the most impressive part of this night was the sense of discovery, not only in the group improvisations or in the individual solos, but the compositions' evoking a sense of wonder as in nature: to discover a place, a feeling and to fill all your senses with one leaf and to let it branch out to surround you with an entire tree and, in turn, a whole forest. As a musician with my own self described "high standards", concert-going can run from extreme boredom to pure inspiration. The latter experience was what I had this past Monday seeing Oregon at the Gathering concert series. The space was St. Mary's Church in Philadelphia which added a great deal of ambience visually and aurally with its soft natural reverb. I was lucky to catch the group doing their soundcheck and I knew the possibility of a special concert was in the making. It happened. For one, the four members of Oregon are at the top of their game musically. 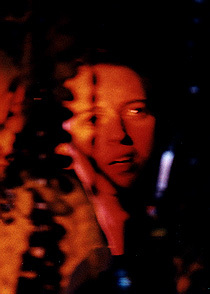 The newest member, Mark Walker, plays as though he'd been a member since the group's inception. What made the night that much more special was the level of enjoyment these guys experienced while playing together. For me there is nothing better than witnessing extraordinary music played with such an exuberance that the audience is swept away in the musical journey. When Keith Brand took the mic before the Oregon concert last Monday evening, I thought for sure he would use the "and now for something completely different" intro, a route I remember Jeff Towne taking before the Monk Gathering some time back. I, awaiting Oregon's stage appearance, was certainly feeling a somewhat diverged. Usually, as a Gathering crowd enters St. Mary's and takes it place amongst the pews, an air of spaciousness remains. I've often had an entire length of seating to myself, with room to stretch out across my pew. I'm able to lay on my back at times and simply watch soft lights smear across St.Mary's canopy while the music fills the air. Yet, I should have realized the night would be different when a friend meticulously scouted out for what he deemed to the be the perfect seat, preconcert, mumbling something about needing a vantage point that would offer the best viewing access of Ralph Towner sporting his guitar. Sure enough, it's show time, and there I sit, and Mr. Brand is welcoming the Oregon boys, and my knees are pressed together; all sort of folks having crammed into my pew. It seemed the entire audience had compressed as far to the front of the church as humanly possible. Half panicked with claustrophobia, contemplating a Moe Howard "spread out!" threat or two, I wondered to myself if this Towner was worth being pancaked for. Pass the syrup, please. But it's not only Towner, my friends. The entire cast of Oregon mixes into one fine, fine group. Ralph Towner is a multifaceted talent. He has written most of Oregon's material. He displayed arduous talent on both six and twelve string acoustic guitars. He played a couple of pieces using a new instrument called a frame guitar. He worked an electric piano and a synthesizer dually to perfection. He's the quietest member of the group on stage. He's one wonderful musician. Something about wind players always scares me. Maybe this is due to the fact that they never seem to inhale. Paul McCandless, one fast playing son-of-a-gun, so often turned tomato red that I, against Gathering policy, kept my cell phone on just in case I needed to phone 911. When I couldn't take watching the transpiring of his ever deepening shade of red, I instead shifted to McCandless' fingers blurringly speed up and down the scales of his assortment of wind instruments...faster than light. Is Glen Moore a character, or what? He worked his bass, big enough to be his mate, as if she were his mate. The two or three times he introduced songs (McCandless handled this chore wonderfully most of the night), Moore had us splitting sides with laughter. Twice he introduced improvisational pieces, one for each set, guaranteeing that the group had no idea of what might transpire. Here Oregon shined. The impromptu piece in the first set reached a level of intensity that left us all, band included, gasping in awe. Set two's improvisation ended with Ralph Towner laughing audibly on stage, after a slightly disconcerting scrape on Moore's bass brought that one to an end. McCandless chipped in that he liked the ending of this piece. We all agreed. Towner, McCandless and Moore have been at this, together, since 1970. And it shows. However, there has been an on again/off again approach with the band's usage of a percussionist. If this night's performance stands to measure, the band certainly flourishes when the switch is on. Mark Walker is presently the man behind the bongos and drums. He appears to be not a day over twenty years old, surely young enough to be an offspring of one of the other three. But, musically, he fits into the bands patterns as if he's been with them since day one. 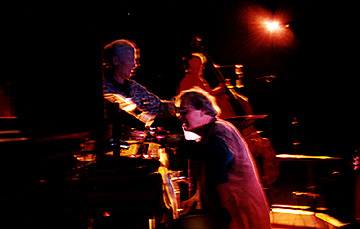 There were times during the concert when Walker took over the show. All four band members had plenty of moments to shine. This was the nature of the night's performance. Each member, and during several songs, would have their go representing the focus of the soundworld, before the band would bring it all together into an amalgamation of music that had us gasping in our seats. Okay, cramped seats. Next time, I'm sitting with Chuck in the back. The evening's first set included two beautiful pieces from the band's "Northwest Passage" release. I was personally disappointed to see that this one wasn't available for sale out in the foyer. 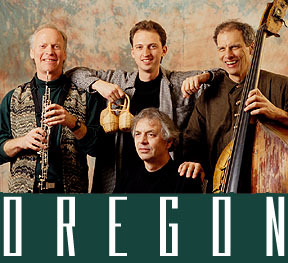 However, Oregon's recent release in collaboration with the Tchaikovsky Symphony Orchestra of Moscow was available. This release was nominated for several Grammy Awards. A couple of pieces from this CD were performed, albeit without the orchestra. Three pieces from Oregon's 'Beyond Words' CD highlighted the second set, including a fine composition written by Moore called 'Pepe Linque'. After set two, a spontaneous standing ovation erupted. We brought Oregon back for an encore. The music was splendidly diversified, all night long. Sometimes straight on jazz, sometimes intricate, but often spacious and beautiful. Thanks to Jeff Towne who thought to book the band while they were in the area to record an Echoes Living Room Concert.